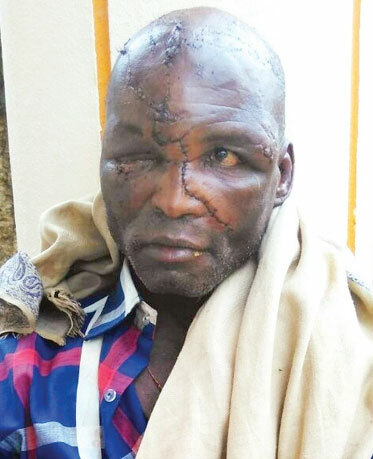 Victim Jube Valanti Adveppache, 58, had been picking mushrooms in one of his fields in southern India when the huge beast attacked without warning. Jube later told wildlife officials and police how the animal - believed to be a sloth bear - leapt on him without warning and would not let him go. The bear, he said, kept breaking off the attack and then restarting it. Jube said it was three hours before the bear seemed convinced he had killed him and moved off into the forests around Haliyal in Karnataka State. He eventually managed to get up and staggered nearly three miles, bleeding heavily, to get back to his village. Hospital officials said he was transferred from an intensive care unit to another hospital to recover. "He is out of immediate danger." 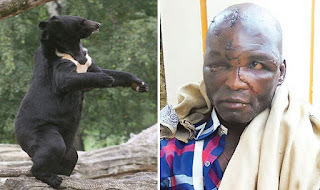 Horrific photos of his injuries reveal deep scars on the man's head where the bear savaged him. One eye is closed and swollen, a thick scar from the bear's fearsome claws runs down the side of his nose. His face and his head are covered in other cuts and bruises.